Kepler scientists have discovered the oldest known system of rocky, Earth-sized planets in the Milky Way. This suggests that terrestrial planets have appeared throughout most of the Universe's 13.8 billion year history — a potential indication of just how ancient some extraterrestrial civilizations could be. Sadly, these five planets are not habitable; they're all parked in tight orbits that see them revolve around their host star in fewer than 10 days. The outermost planet orbits at 0.08 AU, which is about one-fifth the size of Mercury's orbit. That's quite far from the inner edge of the system's habitable zone, which is located ~0.47 AU from the host star. At such a close distance, these planets are much hotter than Mercury. 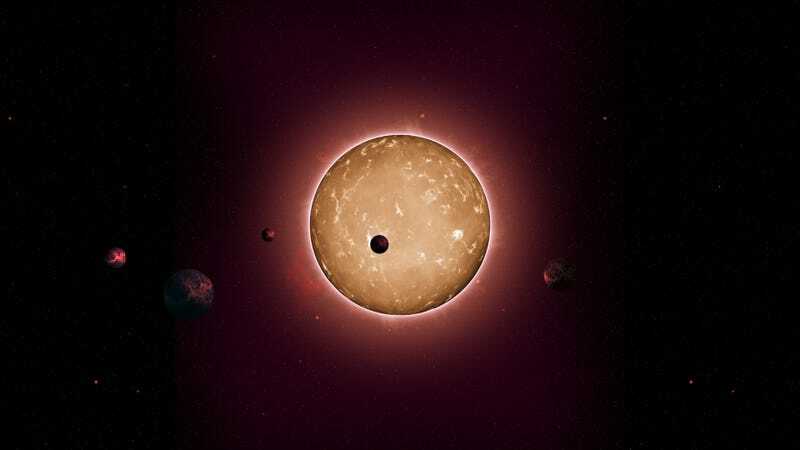 But the discovery shows that rocky planets have been forming for a very, very long time in our galaxy — a strong sign that other systems may have been producing terrestrial planets that reside within their respective habitable zones. Life in the Universe, therefore, may have emerged far earlier than we ever imagined. "The Era of Planet Formation"
The newly discovered planets are part of the Kepler-444 system. It formed some 11.2 billion years ago, a time when the Universe was less than 20% of its current age. That's remarkably old, about 2.5 times older than our solar system. To put that into perspective, by the time Earth formed, these five planets were already older than our planet is today. As noted by the Kepler scientists in a release, "This discovery may now help to pinpoint the beginning of what we might call 'the era of planet formation.'" An adaptive optics image of Kepler-444. Campante et al. Kepler-444 is approximately 117 light-years from Earth and about 25% smaller than our Sun. The sizes of the five planets fall between Mercury and Venus (all of which are smaller than Earth). Interestingly, Kepler-444 is so bright that it can actually be seen with binoculars. The discovery also expands the number of known planets found in low-metallicity environments. "Although photometry alone does not yield the masses of the planets, planetary thermal evolution models predict that the composition of planets with radii less than 0.8 [the radius of Earth] are highly likely rocky." It's highly improbable, therefore, that these are gaseous planets of some sort, such as mini Neptunes. 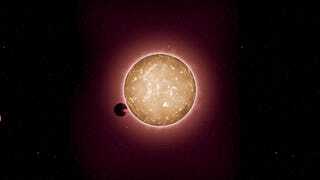 "Kepler-444 is the oldest known system of terrestrial-size planets," write the authors in the study. "We thus show that Earth-size planets have formed throughout most of the Universe's 13.8-billion-year history, providing scope for the existence of ancient life in the Galaxy." The Kepler astronomers used a detection method called asteroseismology. Stars produce resonances, or sound wave oscillations, that become trapped within it. These vibrations, which produce tiny pulses that alter a star's temperature, can be detected in the form of changing luminosities. This data is used to measure a star's diameter, mass, and age. Wavelet analysis of the oscillation power spectrum. Campante et al. The planets themselves were detected by using the transit method. In this case, five distinct planets were discovered as they swept across their host star as scientists on Earth scanned the resultant changes in the sun's brightness. Transit light curves for the five planets. Campante et al. "From the first rocky exoplanets to the discovery of an Earth-size planet orbiting another star in its habitable zone, we are now getting first glimpses of the variety of Galactic environments conducive to the formation of these small worlds," conclude the authors in the study. "As a result, the path toward a more complete understanding of early planet formation in the Galaxy starts unfolding before us." It's important to note that the early universe may not have contained all the prerequisites for life, but as studies have shown, alien life has the potential to emerge in some of the most extreme environments — even those without water. Of course, this finding also further problematizes the Fermi Paradox and the Great Silence. If life could have gotten started so long ago, then where the heck is everyone? Read the entire study at the Astrophysical Journal : "An ancient extrasolar system with five sub-Earth-size planets".